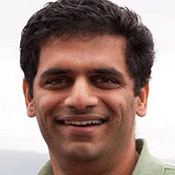 Prior to joining EE, Visvesh was a member of technical staff in the Low-Power Advanced Development Group at AMD, developing new technologies for energy-efficient computing. Visvesh led the research and development effort at AMD that resulted in the first ever resonant clocked commercial microprocessor. Several of his other inventions have been adopted for use in future-generation microprocessors. His current research interests include next-generation clocking circuits and architectures, integrated voltage regulation, ultralow voltage design, and self-optimizing systems. In the past, he has conducted research in the areas of adiabatic computing, adaptive circuit design, and power supply distribution and conversion. Visvesh has authored over 20 publications and holds six patents, with several others pending. His doctoral thesis was selected as the best dissertation in EECS for 2007 and was nominated for the Rackham Graduate School Distinguished Dissertation Award at the University of Michigan. He is a member of the Technical Program Committees of the Custom Integrated Circuits Conference, and the International Conference on VLSI Design. I am interested in understanding and solving problems facing the design of efficient integrated circuits (ICs) and systems over a broad range, from ultra-low power chips to high-performance microprocessors. The end of Dennard scaling has resulted in a "levelling-off" of single-threaded performance in digital systems. It has also ushered in an era of stark trade-offs between performance, energy dissipation, variability and reliability. My group is exploring solutions toward building novel and innovative systems at the intersection of architecture, low-power VLSI and mixed-signal design. Below is a brief description of some of these areas. Clocking. Clocking continues to be a crucial aspect of designing integrated circuits of a high quality, we are currently looking at efficient clock-domain crossing techniques, next generation clock distribution architectures, and frequency-scalable resonant clocking. Power-supply conversion, distribution and regulation The design and analysis of power conversion, delivery and regulation systems has a huge impact on the future of computing and low-power electronics. While energy-eficient computing drives the need for increasingly "micro-regulated" voltage domains, efficient voltage and power conversion for energy-harvesting systems play a key role in overall system capabilities. My group is interested in looking at a number a problems in this area including integrated voltage regulation, efficient voltage conversion for energy-harvesting systems, and distribution and regulation architectures for future 3D stacked silicon complexes. Adaptive circuits and architectures. Future systems-on-chip are likely to consist of a variety of cores, accelerators, memories employing heterogeneous 3D integration. Design time optimization is becoming increasingly un-tenable. My group is looking at a variety of adaptive circuit and system strategies to enable runtime adaptation of silicon to effectively meet runtime requirements. A particularly interesting application of this work is the the area of wireless sensor nodes where interdependencies between power conversion and regulation, processing, memory and communication allow opportunities for creative cross-boundary system adaptation.